Tag line: "Before man walked the earth...it slept for centuries. It is evil. It is real. It is awakening"
John Carpenter is no stranger to horror aficionados, and some of his films (specifically Halloween and The Thing) continue to appear on many fans’ Top-10 lists (mine included). Released in 1987, Prince of Darkness sees Carpenter operating on an entirely different level, combining religion and science to relate an ominous tale of the apocalypse and, in so doing, creating a motion picture as thought-provoking as it is frightening. A dark secret is being stored in the basement of Saint Goddard’s church in downtown Los Angeles. A Catholic priest (Donald Pleasance), who only just found it himself, learns that, for centuries, an organization known as The Brotherhood of Sleep has been guarding a large cylinder that supposedly houses pure evil (in liquid form). In an effort to prove to the world this evil is a very real danger, the priest contacts Professor Howard Birack (Victor Wong), who teaches a course on subatomic particles, and asks him to conduct a series of experiments on the cylinder. Realizing the importance of this find, Birack and several of his students, including Brian Marsh (Jameson Parker), Catherine Danforth (Lisa Blount), and Walter (Dennis Dun), agree to spend the weekend in the abandoned church, studying this strange phenomenon. They are joined by about a half-dozen others, including micro-biologist Dr. Paul Leahy (Peter Jason); and Lisa (Ann yen), a Theology student specializing in archaic languages, who is brought in to interpret an ancient book recently discovered near the site. And what this book contains is quite extraordinary. The force encased inside the cylinder is, in fact, a sentient being, the so-called son of an “Anti-God” that exists in a universe mirroring our own (according to this book, Jesus was, in reality, an extraterrestrial sent to earth to warn us of the danger). It’s foretold that the Son will clear the way for the father’s arrival on earth, and to everyone’s dismay, the time for the son’s manifestation is upon them; the liquid inside the cylinder has been surprisingly active (spewing out mathematical formulas so complex that Catherine can’t identify them), and a large collection of homeless people (clearly under the control of an otherworldly force) have massed outside the church, where, led by a particularly psychotic vagrant (rocker Alice Cooper), they attack anyone who tries to leave. In typical John Carpenter fashion, Prince of Darkness features a number of eerie scenes, from the slightly disturbing (the recurring dream sequence appears to be a grainy video taken outside the church, revealing a cloaked figure lurking in the shadows) to the straight-up terrifying (the most intense moment in the entire film sees one character trapped in a closet, with several of his colleagues, all of whom have been possessed by the evil, lurking just outside). Yet what makes it so damn effective is the sense of dread that permeates throughout, that feeling of impending doom that neither the characters nor the audience can shake. The musical score, composed by Carpenter himself (with an assist from Alan Howarth), enhances the movie’s inherent creepiness, and this dark, gloomy story only gets darker and gloomier as it progresses. 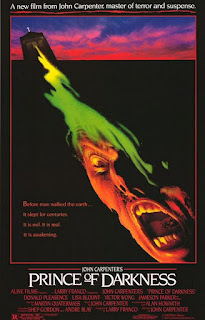 I had seen Prince of Darkness several times before, yet for some reason this latest viewing really struck a nerve with me, revealing the film’s many qualities and drawing me deeper into its tragic story than it ever has before. I’ve been turning it over and over in my head for hours now, and the more I think about it, the more I realize just how impressive a motion picture it is. In fact, it’s so good that it has me re-thinking my posted list of top 10 horror films. Prince of Darkness is a horror masterpiece, and with all due respect to Halloween and The Thing, it might just be John Carpenter’s masterpiece as well.